HILLSBORO -- A steady downpour at Friday's game at Glencoe suited run-happy Newberg just fine as it advanced its Pacific Conference record to 3-1 and maintained a second-place tie with Sherwood in league play with a 35-8 drubbing of the Crimson Tide at Hare Field. The Tigers (3-1 conference, 5-4 overall) grinded out scoring drives of 60 yards on 10 plays, 55 yards on 11 plays, 70 yards on 10 plays and 85 yards on nine plays to keep the Crimson Tide scrambling throughout the game. 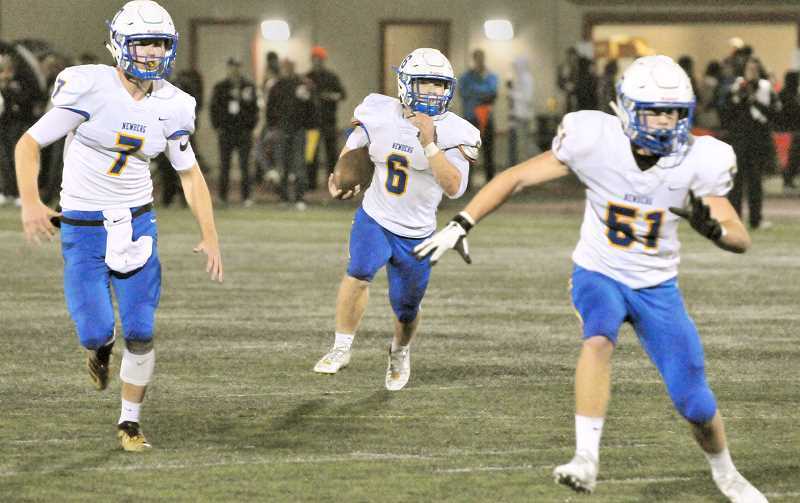 Newberg wrapped its dominant running game around a two play, 28-yard drive into the end zone on senior linebacker Matthew Larson's interception of a Tide quarterback Bryce Fornshell pass with one minute remaining in the first half. 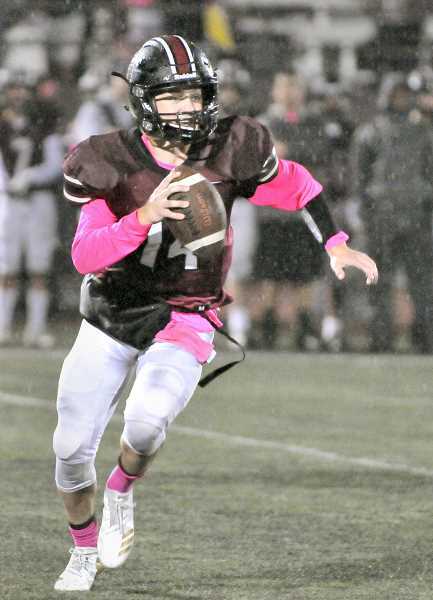 The Tigers didn't attempt a pass until the 1:47 mark in the second quarter, relying instead on the run in soggy conditions that placed a premium on holding onto the ball. NHS coach Kevin Hastin used Tiger running back Lawrence Lundgren to great effect in the game, utilizing the phenom repeatedly in short yardage situations. The senior scored three times in the first half on runs of three, six and two yards. He was stopped on fourth and goal from the one yard line in the fourth quarter as well. He was joined in the scoring jubilee by Larson, in his capacity on offense as a running back, for a seven-yard TD at the 11:22 mark of the second quarter. Glencoe finally got on the board in the third quarter on a 33-yard Forshell pass play and a two-point conversion to make it 35-8 Newberg. Newberg's win -- coupled with Sherwood's 47-16 drubbing of Century and Liberty's 48-27 pasting of McMinnville – served to maintain the status quo in the Pacific Conference. The Tigers, ranked 28th in the state, will await word of their pairing in the first round of the state playoffs, scheduled to begin next week. The Oregon School Activities Association (OSAA), the governing body of high school sports, accepts 21 teams picked by the state's seven leagues, then adds an additional 11 at-large births for the 32-team format.